The server encountered an error processing registration. Please try again later. Note: Step 2 might not apply to you. I did step 2 because I got some choppy black boxes on the screen after upgrading to Chimera 2.0.1.
kill pid_of_htop, pretty neat, isn’t it? 4. change default theme from robbyrussell to gentoop The reason I did the switch is because robbyrussell lacks the indication if a user runs “sudo -s” to become root (given the user is given the privilege) and I happened to be a Gentoo fan. The big yellow X means there are changes under current repository, “exp” in red is the name of the current branch. Once I committed the changes, the big yellow X sign disappeared. 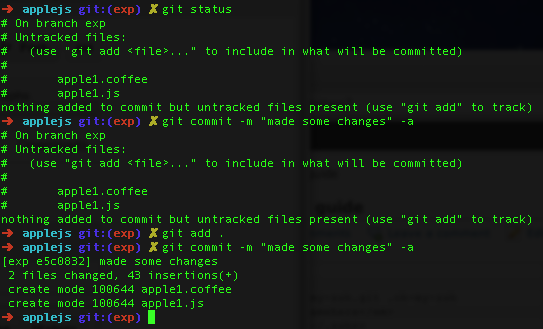 In other words I don’t even need to type git status to check if current repository is clean – can’t stop loving this feature. There are times when an initialization function in a js object needs to be called only once. Here’s one of the solutions I came up with. When F.paint() is called, a check on the initialization tag (need_init) is performed. need_init remains undefined until init() is called for the first time. Now I am ready to paint.